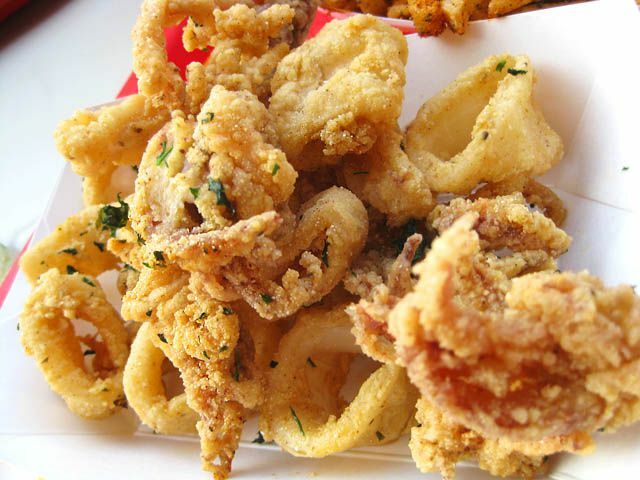 Fried squid, or calamari, is served in just about every psarotaverna or fish tavern in Greece. It's surprisingly easy to make if you want to try your hand at it at home. You can complicate it by making and using a batter, but if you want to do it the way the Greeks do, you'll just use flour. Kalamarakia Tiganita is spelled καλαμαράκια τηγανητά in Greek, pronounced kah-lah-mah-RAHK-yah tee-ghah-nee-TAH. You can use a deep fat fryer instead of a frying pan. You can usually buy frozen whole squid or squid rings at the market. If you slice the squid yourself, the slices should be slightly thick. Putting the flour in a plastic bag then adding the squid and shaking gently to coat does a better job than just rolling the pieces in the flour. Leave the squid in the flour until its slightly soggy, then fry for a nice crisp result. Frying each batch of squid lowers the heat of the oil, so allow the oil to get hot again before adding the next batch. Defrost the squid according to the package instructions, if you're using frozen rings. Otherwise, clean the squid in preparation for frying, keeping the tentacles in one piece. Season the squid with salt. You can also add pepper if desired. Preheat a deep skillet or a heavy-bottomed frying pan over low heat. Pour 1/2 to 3/4-inch of oil into the frying pan. It should not be any deeper than half the depth of the pan. Turn the heat up to high. Dredge the squid in the flour and let sit for a few minutes. Gently shake off any excess flour. Add the squid to the pan when the oil is hot. Check the oil by touching a piece of the calamari to it. If the calamari sizzles, the oil is ready. Fry the rings without crowding them until they're crisp and golden brown on all sides. Remove them with a slotted spoon, and drain on paper towels. Garnish with parsley, and serve with lemon wedges.